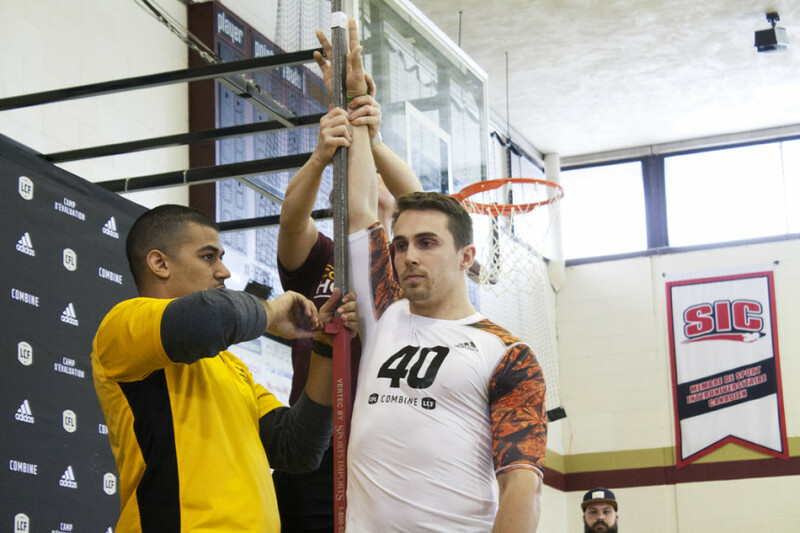 On Wednesday, 45 young and talented athletes made their way out to the sports complex on the Loyola campus of Concordia University to compete in the Canadian Football League’s regional combine. This was their chance to get one step closer to a dream; becoming a professional football player. McGill fullback Devon Stewart, University of Ottawa linebacker Marc-Antoine Laurin, St. Francis Xavier fullback Donald Tabor, and Universite de Montreal defensive back Maiko Zepeda were among the best performers on the day, and were chosen to attend the national combine in Toronto. These athletes would compete in various drills to showcase their abilities to CFL team scouts, coaches and media. Individual drills are there for the athletes to show off their pure athletic ability, while the one-on-one drills give scouts a good idea of how the athletes would fare in live competition. Each and every one of the athletes’ movements are thoroughly analyzed and evaluated by the team scouts. All of these evaluations go towards answering that all important question; is he good enough? This is as close as many of these young athletes will get to becoming professional athletes – but for others, the journey has not even begun. In both cases, the dream will come true through the combine. Every Canadian Interuniversity Sport football player who has exhausted his collegiate eligibility was invited to the combine. There would be a select few amongst them who would be selected to compete in the National Combine held next week in Toronto. But do not be mislead; every athlete present on Wednesday was extremely talented. It is very difficult to play CIS football, and these young men played four to five seasons of it. Concordia not only hosted the event, they ran the drills too. Offensive line coach Ted Karabatsos handled the O-lineman workouts while coach Jason DiValerio manned the linebacker drills. Every station was being coached and run by Stinger coaches. Among the athletes in attendance, three former Stingers were vying for a shot to impress scouts and get that coveted invitation to Toronto. Those players were receiver Daniel Skube, defensive back Rashawn Perry and linebacker Arto Khatchikian. But all three athletes performed well, according to coach Karabatsos, and were very excited for the opportunity to impress scouts and represent the Stingers. “We have an athletic group and a very smart group. They performed well, they were able to execute successfully and they were good,” said Karabatsos. The quality of the football in this part of the country was also on display at the Combine. Eight of the 15 Vanier Cups that have been played in this century were claimed by Reseau de Sport Etudiant du Quebec teams. 20 of the 45 athletes in attendance also played CEGEP football in Quebec.